So this year I did a lot of things differently and am living more like a human being than a messy smelly poor student. I thought I'd share with you all as a parting gift 9 little things that have helped me in 2016. It's mostly word vomit as usual but maybe there's some new ideas in there that could help you too. Especially when two people shoehorn their houses together, it can be hard to find your own quiet space. A whole wall of our bedroom is taken up by my OH's very large computer desk. I've got just enough space at one end to fit my laptop, so the cramped space made it hard to work in there. However, I've put up some shelves above it for storage and covered the bit of wall with things that make me happy. Little bits of origami, photos, watercolour experiments, letters from friends. It's nice to have a little colourful (or not colourful if you like that) space that's your own. 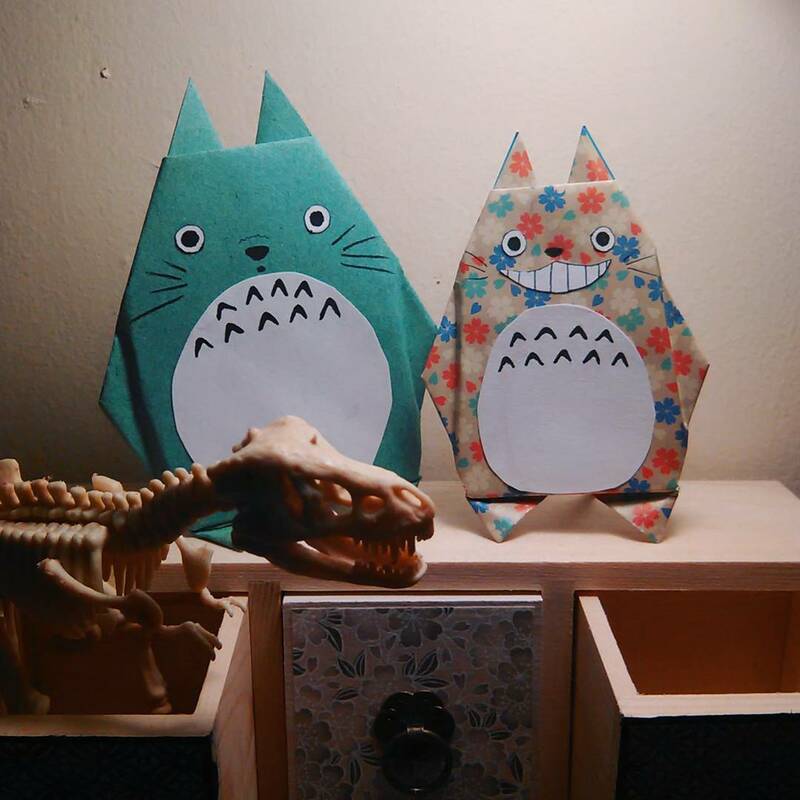 Like these little origami totoros that make my storage space prettier. This year I started keeping a spreadsheet in google drive (for on-the-go access) with family and friends I buy presents for and columns for 'past presents', 'Christmas 2015', 'birthday 2016' etc. There's two columns for each category, one for presents given and one for presents received. It's made it sooo much easier when keeping track of everything, especially this Christmas when I don't want to accidentally get someone the same present as last year. (I sure love spreadsheets!) This one I really like more as a visual aid for keeping track of spending. At the end of each month I go into it and put in the end totals for each of my bank accounts (student account, savings account, Help-to-Buy ISA etc.) with a column at the end for a running total. There's a line graph linked to it that lets me see what money was where at each time with a nice green line above them all that shows how much money I own in the world. I went back and did this all the way from 2013 when I first opened my student bank account with £50. From it I can already tell that I am so much better at managing money and having a job is so worth it. For extra fun I even went and added a big negative line for how much student debt I have. Sorry, did I just say extra fun? The bank was a horrible place to work in over the summer, just horrible. There's such a phobia of technology that people would rather queue up at the one business desk than let me help them use a machine, which makes the queue ridiculous and makes everyone there angry too. Ugh. But occasionally there'd be a person, a nice old lady perhaps, that'd say to me something like "don't let the bastards get you down, you're always cheerful." I kept a note of all the nice things customers had said in my phone to read through after a tough one and give myself a little kick back into gear. Keep a list of projects to refer to when you feel like doing something different. 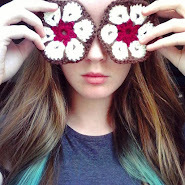 I've got a big to-do list with no end date of all the things I'd like to crochet or cross stitch or sew. Write ideas down as you think of them so you'll never be sat around racking your brains for ideas. Take photos of everything! I take photos of books when I start and finish them, finished projects to refer back to and show others, car park numbers so I don't get lost, everything. Taking a photo of this cross stitch, for example, so I can remind myself to finish the border later. When you used funky coloured hair dye, it gets washed out a bit when you shower. 'Shampoo > rinse > conditioner > rinse' means it gets washed out doubly as much every time I shower. So I switched to 'Conditioner ends > shampoo top of head > rinse' and honestly my very long hair is in so much better condition for it. Little things like putting a heater in the bathroom for those extra chilly mornings, making a cup of tea for when I get out of the shower, getting clothes out beforehand, that sort of stuff. Just to minimise the 'just got of the shower freezing with wet hair dripping everywhere' moments. It's a simple one, but it feels nice to be noticed by others. If that person is having a bit of a hard day, you looking pleased to see them might just make all the difference. There you have it, some things to make your life just a little bit easier. Doing a bit of work at the time to make things easier in the future. In theory, anyway. It's been a pleasure to have been here blogging for a year now. The word of next year is 'focus'- being determined and working hard to get where I want to be.